- Passenger can travel on any departure time based on the selected travel date. View KLIA Ekspres schedule. KLIA Ekspres is the fastest transportation option to get to the KL airport KLIA from KL city center, offered by Express Rail Link Sdn Bhd. With estimated travel time of 28 minutes and 99.7% on-time performance record, you wouldn’t have to worry about arriving at the airport on time. Meanwhile, if you take KLIA Transit train from Kuala Lumpur, you will have to stop by Putrajaya/Cyberjaya and Salak Tinggi first before reaching KLIA/KLIA2. Moreover, there is no traffic on the train tracks and you get to enjoy the air-conditioner and WiFi available on-board. Kuala Lumpur International Airport (KLIA) is mainly for passengers taking Malaysia Airline (MAS) flights and many other international airlines. The boarding point for Kuala Lumpur to KLIA train is at KL Sentral which is a transportation hub located in the heart of KL city. KL Sentral is accessible via many public transportations such as Monorail, MRT, LRT, KTM trains, ETS trains, RapidKL buses and taxis. The arrival point in KLIA is located at the Level 1 of the KLIA Main Terminal Building. The KLIA Departure Hall is on Level 5. The first train from KL Sentral Kuala Lumpur departs as early from 5:00 AM and the last train departs at 12:40 AM. The KLIA Ekspres train schedule is very frequent and available every 15 minutes during peak hours and every 20 minutes during off-peak hours. After midnight, the train schedule is available every 30 minutes. If you book your KLIA Ekspres train tickets online, tickets are valid for the whole day and you can board the train at any time on your selected departure date. 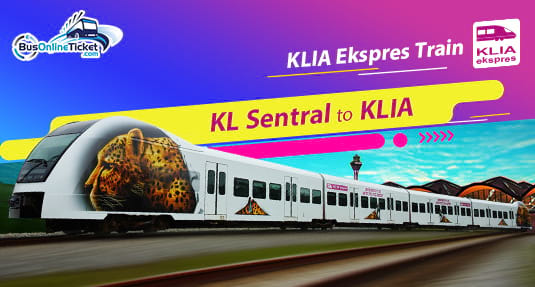 KLIA Ekspres train tickets are available online and you can easily book yours in advance at BusOnlineTicket.com which is an authorized partner of KLIA Ekspres. Booking your KLIA Ekspres tickets online in advance ensures a smooth journey and you can simply use the QR code sent to your email to enter the gate. Printing the ticket is not compulsory as long as you can scan the QR code to the QR code reader on the gates.